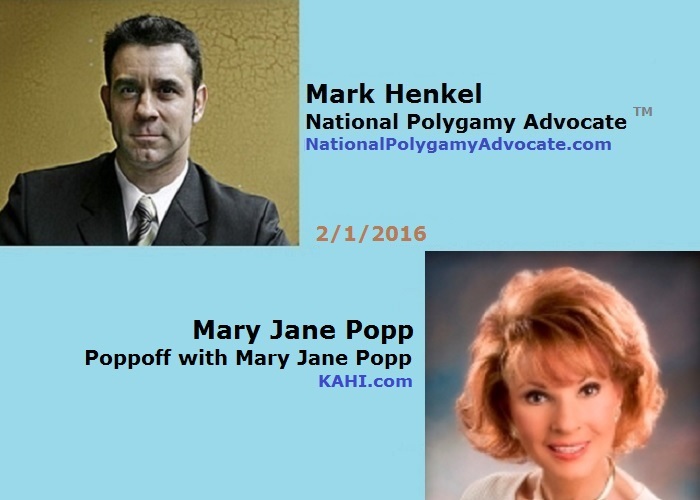 On Monday, February 1, 2016, I was interviewed as a guest on Poppoff with Mary Jane Popp, on KAHI in Sacramento, California, that aired at 6:30 pm local time (9:30 pm ET my time zone). The purpose of this interview pertained to the ongoing polygamy news cycle from Thursday, January 21, 2016: the “Sister Wives” case, Brown v. Buhman, being heard at the Tenth District U.S. Circuit Court of Appeals, in Denver, Colorado. The actual interview occurred at 4:30pm ET. Instead of being a live interview, it turned out to be an unedited “lve on tape” interview.